SayfieReview.com - Featured Column - "Good Economy—Prime Time for Florida Counties to Ask Voters to Pay More"
"Good Economy—Prime Time for Florida Counties to Ask Voters to Pay More"
Floridians are facing one of the longest ballots in recent history, including 12 proposed constitutional amendments. Voters in 15 of the state’s 67 counties voters, including some of its most populous, will also be asked whether they support raising taxes or, in other cases, allowing their county government to borrow millions of dollars via general obligation (tax-backed) bonds. Nearly half of the state’s registered voters (49%) will see a local tax or bond question on their ballot. When the economy is strong and consumer confidence is high and fear of an economic downturn is imminent. During periods of high growth when residents demand relief from traffic congestion and repair/expansion of critical infrastructure. Citizen-led campaigns urge local governments to purchase available land for recreational uses—such as parks, libraries, biking and hiking trails, sports complexes—or businesses and nonprofits push for affordable housing or technological improvements. One could also argue that another big motive for these counties to make the “big ask” to voters in 2018 is the potential passage of Amendment 1. Opponents argue it would reduce local property tax revenue and force Florida’s local governments to raise taxes or cut local services--a difficult choice that would be made worse if the economy were to worsen. It is well-known that getting voter approval of new or increased taxes during tough economic times can be challenging. Pasco and Sarasota counties, both suburban, have experienced moderate growth in recent years. Of the 5 bond proposals they have put before their voters (Pasco-4; Sarsaota-1), 3 are earmarked for recreation/leisure-related activities (parks and recreation, libraries, trails); and 2 for needed infrastructure repair/expansion (fire and rescue, jails). All five of the counties asking for millage increases in their property tax (Alachua, Charlotte, Miami Dade, Palm Beach, Taylor) have earmarked the revenue for a wide range of education-related spending—from teachers to school safety. Note: The track record for education-related funding proposals (via either the local option property tax or a sales tax) has been very good to date. Ten counties placed school tax increase proposals before their voters in the August 2018 primary; all passed. 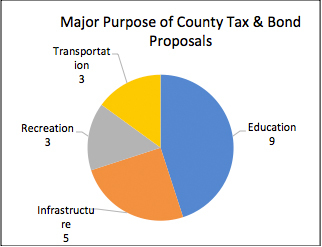 Among the 9 counties proposing sales-tax related increases, 3 are tagged to transportation in two large counties (Hillsborough, Broward) plus St. Lucie, 4 to education infrastructure (Alachua, Hillsborough, Martin, and Polk), and 2 to general infrastructure improvements (Collier, Okaloosa). Putting Multiple Proposals Before County Voters: Good or Bad Strategy? Three counties are putting multiple proposals before their voters: Pasco (4 bond proposals but no tax proposal), Hillsborough (2 sales tax increases—for schools and transportation), and Alachua (I property tax and 1 sales tax increase). Pasco County paired three recreational/leisure proposals with a safety-related one—jail construction. Each proposal is fairly popular in a suburban family-centric county and none mentions the word “tax.” Alachua earmarked both of its tax proposals to education in a county whose economy is dominated by education. Hillsborough County’s multiple-proposal choice is perhaps the most intriguing because passage of both the proposed sales tax increases would make the County’s sales tax the highest in the state. Supporters of both taxes point to the growth-related needs—traffic congestion, aging school infrastructure. (Of these 15 counties with tax and bond referenda, Hillsborough has experienced the highest growth rate since 2010—11.2%.) What will be of great interest is whether Hillsborough County voters approve one, but not the other, and if they do, which function is deemed most critical in a large high-growth area. Florida’s local governments have long been worried about the slow erosion of local control vis-a-vis state government and fearful of reductions in state revenue sharing. Should Amendment 5 pass requiring a super-majority vote by the Florida Legislature to increase taxes, state government may begin to share even less of its revenue with local governments. The 15 counties that have placed tax and bond proposals before their voters have calculated that this election year amid a sound economy is their best chance to enhance their revenues to fund popular, but expensive, projects and, in the case, of bonds, secure low interest rates. The other 52 counties who have sat it out will be watching to see how many proposals pass. They may be sorry they didn’t join in—timing can be everything in politics. This list only considers county-wide local tax referenda on the General Election ballot. Some counties, such as Bay County, had local tax referenda during the August Primary Election. Other voters, such as those in the cities of Cape Coral and Madeira Beach, will see municipal tax questions on their General Election ballot.